As we embark upon our next big adventure, planning for the migration from Drupal 7 to Drupal 8 of EdWeb, the University’s central CMS, a group of us from Information Services are here in Vienna this week attending DrupalCon 2017. We are a small but diverse bunch of project managers, developers, sysadmins, and support staff who all play a part in building, running and managing EdWeb. For the next few days we’ll be sharing our thoughts on the sessions we attend, recommending top sessions, and giving our key takeaways – not the wurst variety – from our DrupalCon experience. On Tuesday, we started DrupalCon the right way by attending the always entertaining Pre-note, followed by Dries Buytaert’s traditional Driesnote keynote presentation on the state of Drupal. We then set out on our different tracks, paths crossing at coffee and lunch, for the first intense but interesting day of DrupalCon sessions. Last week Development Services, in collaboration with colleagues in the University Website Programme team, helped run a code sprint with developers from around the University to work on fixes and enhancements for EdWeb, the Drupal-based content management system that underpins the University’s website. This post gathers some technology-agnostic thoughts on what we did to prepare, and how we ran our sprint, that might be of interest to anyone thinking about running a similar event. 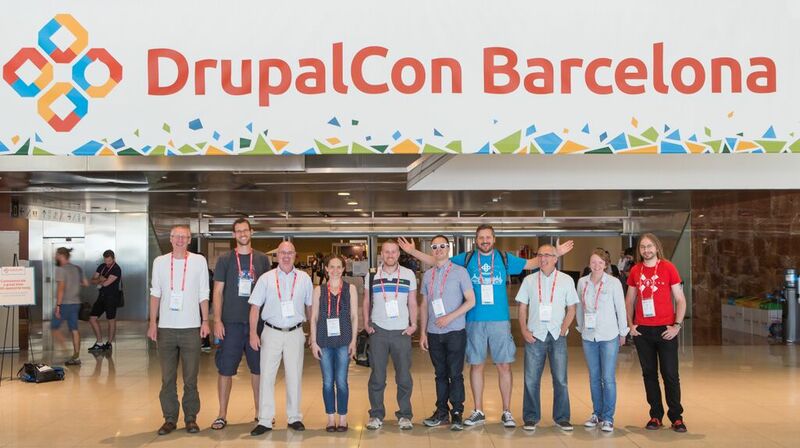 This week myself and a few colleagues attended DrupalCon 2015 in Barcelona and I have been posting some general comments as well as session summaries from Day 1, Day 2 and Day 3. On Friday, after the main conference ended, the conference centre remained open for the traditional post-conference code sprints, including the Mentored Core Sprint, which myself, Adrian Richardson and Andrew Gleeson attended for the first time. It turns out code sprints are addictive; we arrived at 9am intending to stay until mid-afternoon and were thrown out along with the last remaining sprinters when the building closed at 6pm! Fuelled only by water, caffeine and a very short lunch eaten at our code sprint table, each of us contributed something during the session to move Drupal 8 core along. Some other first-time sprinters were even lucky enough to have their first contribution made to Drupal in a live commit by Angela Byron (webchick) part-way through the code sprint! Having missed out on attending previous DrupalCon code sprints, it was great to finally have the opportunity to join in and contribute to Drupal! Before arriving for the code sprint, we had prepared our laptops with a Drupal 8 install as well as the various tools described on the DrupalCon website, choosing the Acquia Dev Desktop as the quickest option to get started. We began the day at the First Time Sprinter Workshop to ensure we were all ready to go, and then moved through to the code sprint room, joining the many Drupalistas who had already settled down to coding. The mentor for our table was Rachel Lawson (rachel_norfolk on Drupal.org), who was friendly and extremely helpful in keeping us on the right track as we worked on the issues we picked up from the issue queue. With Rachel’s guidance, Andrew and I managed to find a couple of related UI issues in Drupal core, specifically the Configuration and Structure administration pages, to give us some experience of using the issue queue. Neither of us had used the issue queue in anger before – the most I have done is re-roll a patch – so we chose something simple, and Rachel kept us right when it came to documenting what we were doing by commenting on the issues we picked up. When 6pm came and we had to leave, we had each uploaded a patch for the issue we were working on, and although neither resulted in a commit before we left, it was very satisfying to feel that we had moved both issues along and made a first small contribution to Drupal core. It was also comforting to see during the excitement of the live commit session in the afternoon that some of the committed changes were of a similar scale to those which we had made! Drupal community collaboration in action! It was really interesting (and fun!) 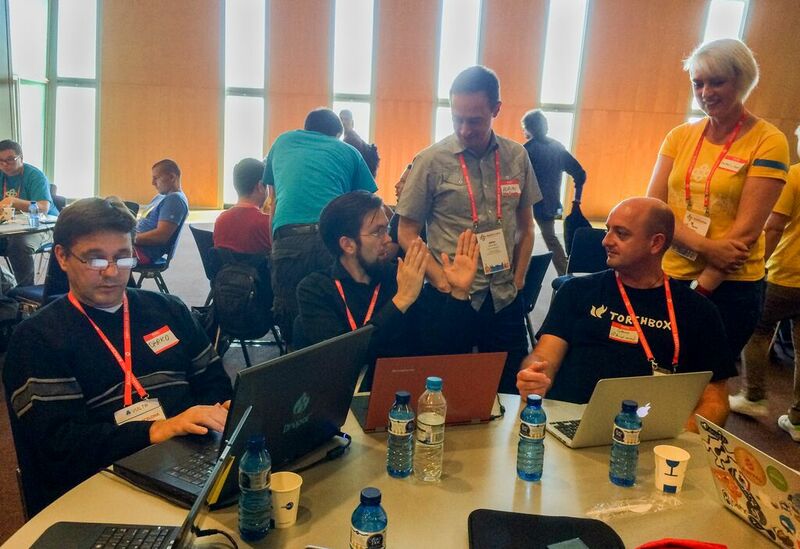 to take part in a DrupalCon mentored code sprint and witness first hand one of the best things about the Drupal community – the spirit of openness and collaboration that has made it a success. Every contribution, whether large or small, can add something, and every contributor can feel valued by the community for the part they play. I have already been looking at the issue queue for something else to pick up; the challenge will be to find the space and time to continue what we started at DrupalCon! This week myself and a few colleagues attended DrupalCon 2015 in Barcelona and I have been posting some general comments as well as session summaries from Day 1 and Day 2. In a new approach to the early morning keynotes at DrupalCon, Day 3 began with two Community Keynotes presented by David Rosaz and Mike Bell. It was fantastic to see two community members being given the DrupalCon main stage as a forum to present on two very different topics that are important to them, and of interest to the community in general. David’s presentation of his PhD research covered the different types of contribution made to peer communities such as the Drupal community, highlighting how important all types of contribution are to the continuing success of any such community, as well as how contributions can be encouraged and sustained to strengthen it. Mike’s talk was of a much more personal nature, using his own experience of mental health problems to open a conversation on this difficult topic in a presentation that clearly chimed with many who were physically present in the audience or following the session online. It was inspiring to hear Mike speak so eloquently about his own mental health issues, how he has learned to accept and deal with them, and how others can do the same; such openness is rare, particularly in front of such a large audience, many of whom are complete strangers. The impact of his presentation, and the audience’s response to it, testifies not only to Mike’s bravery in standing up there to give such a personal talk, a nerve-wracking experience in itself, but also to the inclusive, supportive nature of the Drupal community. Our experiences of some of the sessions from the final day of DrupalCon in Barcelona are outlined below. Thanks to Riky, Tim, Andrew, Adrian and Chris for contributing their thoughts on sessions they attended; any errors, omissions or misinterpretations in their edited notes are entirely mine. Most of the sessions mentioned below, along with many more interesting talks, are recorded and available on the DrupalCon YouTube channel. The day finished with the Closing Session, where it was announced that DrupalCon 2016 will be in Dublin. This session covered how a Drupal back-end can be decoupled from the front-end, supplying back-end APIs which allow an alternative front-end development tool to be used, a web development technique that is extremely prevalent today. The speaker acknowledged that Drupal does content management very well, but the website delivery tool out of the box does not always live up to the standard of the Drupal back-end. When constructing the model – adding a new content type – the process of getting fields set up and widgets created to configure the admin form is quick, but a lot of time is required to get the output right in the theming layer. Here, a Fully Decoupled model was proposed to address the limitations of front-end development in Drupal. The speaker noted that an alternative Progressive/Hybrid model could use Drupal to provide, for example, the header, footer and menu, with AngularJS for the rich, functional part of the page. AngularJS is a framework for building decoupled front-end applications, chosen from the many alternatives for several reasons. The large development community makes it easy to get help, and the ready availability of lots of modules via ngmodules.org provides solutions for common problems that the community has already solved. AngularJS embodies OO concepts (dependency injection, etc.) to give a much cleaner codebase, and uses known recipes for laying out the structure of code and solving problems. The framework is supported by Google, which suggests that it should have longevity. The format of the session was a whistle-stop tour of the tools required to prepare for using Drupal with AngularJS, followed by a demonstration of how the Drupal Views module can be used in conjunction with Drupal 8 RESTful web services to implement a back-end API which will generate view output in pure JSON form for consumption by a front-end application developed in AngularJS. a Testing framework, in this case Karma, which comes with AngularJS (Behat is another option). Having outlined the toolkit required, the speaker went on to demonstrate the stages of development, showing how straightforward decoupling Drupal can be once you have the right tools in place. The steps covered are described below, but this summary is no substitute for watching the excellent session recording and reviewing the code samples used in the demonstration. A new display type for views is provided by RESTful web services, generating “just the data” in raw JSON format when the API URL is called. When the View is filtered, for example by ID, only filtered content appears in the JSON RESTful output. A scaffolding tool, Yeoman in this example, provides recipes which do the legwork of building the initial application. A simple command creates the base directories that are required for the web application, such as app for the code, dist for the compiled/minified files, required components for node & bower, etc. In this example, Node was used for the server side and Bower supplied the dependencies for AngularJS. A Grunt file defines the tasks which can be done on the project; an IDE such as PHPStorm may provide a pretty visual representation of this. It was extremely impressive to see just how much of the repetitive process of getting an application up and running can be automated. The scaffolding process creates an empty application that is ready for code! The AngularJS application demonstrated was a single page application using index.html (HTML is the templating language for AngularJS). The compiled public version of this file differs from the version used during development because the Grunt task from the scaffolding recipe takes out unnecessary lines that are only for dev purposes when compiling the application. Again, automation simplifies the development and deployment process. In index.html, an attribute on the body tag (ng-app) acts as a directive to provide scope for the AngularJS module that will provide functionality. The app.js file in the AngularJS application contains router information to let the front-end know where to send requests. AngularJS uses dependency injection to inject the correct service at runtime; all that is needed is to provide the service name in arguments when defining the function. It was noted that HTML 5 mode needs to be enabled and base defined in order to use clean URLs, otherwise you get # in URLs. The $routeProvider configuration is used to tell AngularJS what template to use and what controller to use for each URL. The response handler is defined in a .js file, and a template file generates the application output using the RESTful web services output drawn from Drupal. Et voila, with all of this in place, the Drupal 8 back-end is successfully decoupled and content consumed using a front-end AngularJS application. Having covered the creation of the application, the demonstration went on to extend it, installing a new client-side package using Bower, which downloads a dependency that can then be configured in AngularJS app. This is done by including the dependency to the JS file for the package in the index.html file and adding the dependency to app.js in the section where dependencies are configured. Once the new client-side package is configured via these simple steps, it is ready to use. The speaker briefly touched on equivalent functionality for Drupal 7, which does not have the built-in RESTful web services provided by Drupal 8. The services module can open up all nodes on the system via GUI config, and hooks can be used to override how the data is sent back. Alternatively, the RESTful module is code-based & gives more control over how the data is returned. The generator-hedley Yeoman script provides a scaffodling recipe to build a Drupal 7 back-end with an Angular application client, and includes Behat as the testing framework. This session was very well presented and incredibly dense; the speaker not only provided background on the reasons for decoupling Drupal and how RESTful web services can be used to achieve this, but also gave a really good overview of how an AngularJS application is structured, showing just how clean the code can be and how well back-end and front-end elements are separated. Some developers in IS Applications are already exploring the possibilities of AngularJS in the context of uPortal development (see Unit testing AngularJS portlet with Maven and Jasmin and Making Portlets Angular); what we saw here indicates that we should definitely be pursuing this further. Decoupling allows the best tool to be used for the particular task in hand. The exciting potential is not limited to the Drupal context; given how much of the web is now being delivered using these decoupling techniques, we should start making the most of the flexibility they provide. The main takeaway from this session covers the question I raised on UX. What we did during the EdWeb project around UX was basically correct but too chunky; it could be refined to be more efficient by doing the UX in smaller chunks and earlier. Another improvement would be starting the wire-framing before the design is complete, the caveat being to do this where this fits. A second takeaway is around project communication, the two key words here are “early” and “transparent”! Below is a summary of the questions and discussion. Also, check out the Wunder Way at http://way.wunder.io, where Wunderroot explain their project delivery strategy. Q: How much do you explain to your clients about what Drupal is as a community? All three said that they explain to their customers the principles behind the community, usually at the outset, and attempt to educate their clients and encourage their teams to engage and, where possible, contribute to the community. It’s also important to get their clients on board so that code can be fed back to the community after a project has finished where this is appropriate. All three noted that there are different options for time recording from individual recording across a client/community split to having a percentage within a sprint for community-focused work. Also, community time spent during office hours needs to be met with the same amount of time outside of the organisation. Q: How can small teams with a limited number of people and resources accommodate all the traditional Agile roles and processes? In this situation it is important to concentrate on the most important parts and not try to do everything at once. Firstly, use communication as a tool to ensure that user stories correctly generate the deliverables to achieve the project objectives. With this in mind, it is important to understand why a feature is needed. The “so that” part of the story needs to clearly identify why something is wanted. Again on the communications front, stand-ups are the key to transparency within the project team. Q: How is UX incorporated into your Agile process, in particular in projects with a large number of user stories and pressure to get things out the door? Simple answer – wire-frames and process flow! Test often and early and keep it simple. Test on prototypes and allow sufficient time for this. It is good practice for the person doing the design not to pass the UX. There is no perfect way, but the key is dialogue! It is not recommended to wait until all the various design parts are finished before starting, and it’s important to keep asking what does the user really need. Find a way to confirm that by getting real end-users involved at the earliest stage possible. Also, UX starts at the beginning of a project with customer journeys. Q: What is the ideal sprint length? Two weeks, with a regular meeting structure including adequate time for planning and review. The whole team needs to be involved in sprint/iteration review. For some projects shorter sprint/iteration are a better fit, especially where faster demos are required; likewise under certain circumstances it may be better for a longer sprint/iteration duration. Q: What is the best testing approach? The key here is comprehensive automated testing, peer testing and of course dumb user (PM!) testing. It is also good practice to include testing in the definition of “done”, enforcing the idea that a user story is not done until testing is complete. Q: How can things that were missed during discovery be picked up at a later stage, and how is this communicated with the client? It’s easy: go back to the client at the earliest opportunity. Secondly, if this means extra scope then something has to give, and the client needs to prioritise. To avoid this happening, it’s important that the clients understand the principles of Agile and how it works. Change will always happen; it needs to be embraced and communicated, early and accurately, in order to allow prioritisation. In this session, the speaker talked about how Pantheon successfully maintain a worldwide engineering team where 30% of engineers work remotely. A distributed culture gives autonomy to function in space and time. It has several benefits to the company, such as higher availability of staff and greater coverage of time zones for supporting services, but also benefits staff members too, allowing greater flexibility in how they work, and freeing up time which would otherwise be spent on commuting to an office. YubiKeys, a hardware key which needs to be plugged into a PC by a staff member, for 2 Factor Authentication. However, there are things which aren’t as easy when working in a distributed manner. For Pantheon, trust, security and morale are very important; negativity and staff frustration can be amplified when working remotely. Pantheon introduced mandatory working from home days so that all staff could empathise with those who don’t work in an office. The bottom line is that you cannot beat actually getting together in person, but that doing so in a relaxed and more social manner can strongly aid working together remotely, even if only between different offices, by opening communication channels. While we don’t have much distributed working in IS Applications, a lot of the tools were interesting and principles and techniques were discussed here which can be applied to people working in offices in the same city, but located in different offices and across different teams. We have equivalents for some of the tools demonstrated (HipChat, Skype for Business, Jira and Jira Agile), but using PagerDuty as an alerting system, 2FA hardware keys and extending HipChat with chat bots were all ideas which I will investigate further to see if they could be adopted within the department. The session started by describing the old Continuous Integration workflow used by FFW; there was a single development environment, with all commits made to the master branch and then master was deployed to DEV, which caused shared resource problems and took too long for developers to configure their local development environment each time. Their current workflow is now much better, and in some ways similar to the development performed for the Drupal projects: local Vagrant VMs are used, with feature branches in Git and automated testing on pull requests, BackTrac shows visual diffs between site versions and multi-node Munin for OS monitoring. To enable their new workflow FFW produced CIBox, a standardised, preconfigured way to deploy the Jenkins continuous integration server. These are Vagrant Ubuntu VMs configured with Ansible and setup to use a GitHub project. The Jenkins VMs have Jenkins plugins, LAMP with SSL, CodeSniffer and JSHint code sniffers, SCSS-Lint for SASS file linting, security linters, Jetty and Solr, Selenium and Behat, and Drupal configuration instantly available. While it is unlikely that we would use CIBox to replace our current Bamboo configuration, it was encouraging to see that many of the improved workflow techniques used by FFW are already being adopted by Development Services (Git with feature branches) or are soon to be investigated (local Vagrant development environments). So began the confident speaker in a very exciting talk about the Probo Continuous Integration server. Traditionally in modern CI workflows, issues would be created and assigned to developers, they would create code and commit it to a feature branch, then this would be reviewed in DEV. However, despite these ‘best practices’, having multiple tickets worked on in one feature branch can mean cherry-picking pain if the Business is only happy that some of the issues have been successfully completed. An alternative workflow proposed by Probo is to still have assigned tickets get coded on by developers and committed to a feature branch, but then have these feature branches get reviewed in their own temporary environments. This allows far more useful QA to be performed and avoids situations where only half a feature branch is ready for merging. To enable this alternative workflow which distinguishes the tool from being “yet another CI server”, Probo was created. Available as both a hosted SaaS solution and as an open source project, Probo watches a GitHub project and automatically creates a temporary environment on the creation of a pull request. The technology it runs on is also interesting, using ‘fat’ Docker containers which treat an environment as a single unit. The process of isolating individual features on a branch is actually similar to how feature branches were used in the project to develop the University’s new Drupal CMS, EdWeb. Each feature branch represented the functionality for a particular user story, but rather than having temporary environments automatically spin up, each branch was deployed to the Dev infrastructure, and only merged when ready. Automatic deployment of a temporary environment for each branch would have saved us having to manage the slot for deployment of a feature branch to Dev. Another difference is that QA by the business was carried out in a Test environment after merging with other features; whilst it did not happen often, we were still sometimes in a position where features that had been merged were not quite ready for production. The ability for the business to do their QA on the feature branch in a temporary environment would have been extremely useful. The session also highlighted a flaw in the new workflows being developed as part of our Python adoption. This was a very entertaining session that I would encourage others to watch. Having a way to spin up temporary environments for QA is a very powerful technique which can be applied not just to Drupal, but to all of our development, and is something I intend to investigate further. This session centred around Shoov, an open sourced visual regression tool developed by Gizra. Shoov provides both live monitoring of an application – as you would get from pingdom or 24×7 – and live visual regression testing. Testing for visual regression on the live site allows you to test for issues introduced by 3rd party elements, such as Facebook and Twitter widgets, as well as pick up on elements not rendering as expected, which cannot be spotted by conventional tests. It helps identify the cases where the site is broken as far as the users are concerned, but more conventional monitoring would report everything to be OK. The session demonstrated how to use Behat to define your tests, and how to run the same test for multiple browsers (Chrome, IE, etc) on multiple platforms (Windows 7, OS X Yosemite, iPhone 5, etc) across multiple viewports (320, 640, 960, etc). You aren’t tied to Behat for testing; cucumber, casper.js and others are also supported. The demonstration also covered how to exclude specific elements on the page that you always expect to differ from your base element, such as video, image carousels or other animated elements. You just use a CSS3 identifier to specify whether it should be excluded, hidden or removed before generating the diff image. Not only do you get a high contrast image diff, as Wraith generates (see also Fundamentals of Front-End Ops), but you can also get an image overlay where you can swipe to reveal one version overlaid on the other. RDFa from schema.org is now in Drupal 8 core and this session showed what is currently possible with the help of contrib modules and what is in the pipeline with sandbox modules. There is a lot of work going on to reduce the overhead both for site builders and site users in adding semantic markup to their pages. In Drupal 7 it is not a quick process to build a new entity and map its fields to RDFa properties. With the RDF UI module it becomes very easy to generate a new content type based on a schema.org definition. If you want to create a new sporting event content type for example, you can specify that it is to be generated with a schema.org definition and you are just presented with a list of fields derived from http://schema.org/SportsEvent; then you just need to select those properties you want to use and generate fields for, and the entity is built for you with all the RDFa mapping done. Keeping to the premise that you shouldn’t be replicating content in many places, there is a lot of effort going into tapping into external sources for taxonomies and marking those up with the correct RDFa automatically. Being able to have Entity Reference Fields take data from external APIs means you don’t have to replicate the effort in maintaining the taxonomy. For instance, you want to have the user select a genre for your music site, just point your entity reference field at the Genre API and offload that work while ensuring the semantic markup is also there to help search engines give intelligent results for searches by music genre. When it comes to user-generated content and including semantic markup, there has only really been the RDFa Content Editor (RDFaCE) plugin for TinyMCE. But now we have a couple of extra buttons coming to CKEditor in Drupal 8 to allow users to apply semantic links to content – with dynamic lookups to Wikidata – to make it easy for you to, for instance, mark the word “Paris” in your content as a prince of Troy rather than have search engines interpret your content as relevant for the capital of France. There is a dynamic lookup based on your initial selection which you can further refine with additional terms to locate the correct “Paris” in the list and select that, and this is all without leaving your main workflow, making it more likely that content editors will actually use semantic markup. This session covered lessons learned during the development of the ERPAL distribution. There are many uses for a distribution platform, which can start to introduce new challenges. At the University our mechanism for supplying a Distribution profile matching the central Drupal CMS provision is still quite new, as is using Drupal in general. Although not widely used at the moment, there is quite a lot of scope for sites to implement sites based on the Distribution. It is however quite difficult to pre-empt how something so new will be used; we should remain aware of the potential is it matures in order to exploit it. I attended this session with a colleague from the University Website Programme team, who manage the central Drupal CMS provision, EdWeb. Afterwards, the talk sparked a conversation about our own distribution and issues which we might have at the moment. The main thing that came out of this discussion is that a default config for our distribution site would be useful to make it easier for users to get up and running with working with it. We will follow this up by writing up some of the areas which have already arisen as needing some configuration for new users of our distribution. We can then identify how to incorporate this into this distribution itself, or even just into the one-click distribution provided on our central hosting system, which will be much simpler to achieve, and may be all that is required. In this session, Dries talked mainly about the high and low points of the Drupal 8 project. One of the main suggestions that came out of this was to release fewer things sooner, which is a strategy that will be adopted for future Drupal releases. It’s possible to see parallels between the Drupal 8 project and our project to develop the central Drupal CMS, EdWeb, giving some perspective on what we have done and achieved, and suggesting how we might proceed in future. On Tuesday I posted some comments on the start of DrupalCon 2015 in Barcelona, where myself and a few colleagues are spending this week. The major strands this year are Docker, performance and scalability issues, the Symfony framework in a Drupal 8 context, and using headless Drupal with an alternative toolkit to provide the front-end. So far it’s been really interesting to see how sessions on Symfony and Drupal 8 this year have progressed from last year’s DrupalCon in terms of the complexity of what is being covered. It’s also interesting to see how many attendees are using tools like Vagrant, Docker and Jenkins to take the pain out of manual configuration and deployment. We have been using automated deployment tools for application code for some time now in IS Apps; configuration management and automatic creation of server environments is something that could further streamline our deployment workflow. Our experiences of some of Tuesday’s DrupalCon sessions are outlined below. Thanks to Riky, Tim, Andrew, Adrian and Chris for contributing their thoughts on sessions they attended; any errors, omissions or misinterpretations in their edited notes are entirely mine. Most of the sessions mentioned below, along with many more interesting talks, are recorded and available on the DrupalCon YouTube channel. Drupal 8 makes use of many Symfony components, and this session covered the differences between the two frameworks to help decide which to use for projects. Drupal uses about a third of the Symfony components and you don’t need to know Symfony to develop Drupal. Some differences are more obvious than others, such as while the application entry point in Drupal 8 is index.php, in Symfony it’s web/app.php and web/app_dev.php. These two entry points arise from the fact that Symfony enforces a programmatic toggle between Development and Production modes: you push generated code to production heads; you do not compile on production boxes. Drupal uses the kernel a little differently and imposes stricter coding standards. For instance Drupal always uses the View event whereas this is discouraged in Symfony. Drupal 8 coding standards are quite strict in prescribing when to use YAML or Annotations for configuration. With Symfony configuration you are free to use PHP, XML, YAML or Annotations, although best practice is to pick one and stick to it. Coming from Drupal 7, one of the fundamental differences in Symfony is that there are no functions; it’s all methods, with only a few static functions available. All meaningful logic in Symfony is in services, which are stateless objects. Paths and routing are handled differently in Symfony and Drupal 8. In Drupal 8, you can only use module routing.yml files or events, not annotations, XML or PHP. Also, you don’t have path nesting or slugs in Drupal 8. While both frameworks now use twig in the theming layer, when working in Drupal 8 you work with multiple twig files for each element, mirroring templating system in Drupal 7. Symfony templating uses only one file which extend twig files and override blocks defined in the parent twig file(s). Also Drupal always requires a render array; you don’t return rendered output directly in controllers. Drupal has multiple APIs for storing content data, Symfony doesn’t have anything: you use Doctrine (or something else). Doctrine can only store primitive data and being a stand-alone PHP project has different event listeners from Symfony. This talk highlights the fact that whilst Drupal 8 is using Symfony components, these are very much used with a Drupal flavour. Comprehending Drupal 8 and how it uses Symfony requires an understanding of what has gone before in previous versions of Drupal as well as knowledge of Symfony concepts and techniques. In this session, Danish Digital Agency Adapt covered the background to their move from a Waterfall project methodology to an Agile approach, describing their experience of that transition and specifically targeting how they tackled estimation. Starting from a position where they were losing money on 50% of their projects due to inaccurate estimations and the need for their customers to prioritise scope, they adopted an Agile “light” methodology, only to quickly realise that with Agile it needs to be all or nothing. The presentation continued with an outline of the process used to define user stories, use of planning poker, and the need for clearly defined roles and just-in-time management. The key to relative estimation, i.e. measuring feature size in story points not hours, is to involve all of the project team members in the process. Time boxed planning poker sessions, with limited discussion, allowed the knowledge level across the project team to be increased leading to more accurate forecasting. The iteration or sprint velocity was then calculated by breaking down the tasks (from development to testing) into the hours expected to take to complete. If a story took longer to complete than expected, the user story points associated with that user story did not change but this information was then used to forecast how much could be delivered within the project; this allowed the customer to prioritise what remained in the backlog. The two main benefits derived from this change in approach to delivering projects was that, firstly, they were now in a position to keep to fixed budgets and secondly, knowledge was gained during the estimation process. However there were also negatives, primarily concerned with small projects where this approach has proved difficult to implement and there is often not sufficient time for people to become accustomed to this approach. My main takeaways from this session are “Customise processes along the way” and “Know what you don’t know and accept that!”. Projects and customers (business units) are different and there is a need to refine and adapt the Agile process where experience shows that refinement is required. The more experience the project team have using Agile, the easier this process becomes. At the outset of a project, especially with larger scale projects, there are inevitably unknowns; it’s crucial to identify and accept these unknowns. As a project progresses, unknowns should become knowns and these can be requirements, risks or opportunities. This was an engaging (if somewhat caffine fueled!) session. Drupal currently has a problem with the separation of configuration from content. Code is developed in DEV then pushed out to TEST, STAGING, then LIVE. Content, however, is created on LIVE and the other environments are refreshed from it. “Content” can be thought of as the database, which has tables for both the created content and the configuration, but as we want Drupal configuration to be developed in DEV and tested through the environments, what is really needed is for configuration to be treated like code. Drupal 7 does not have a good way to deal with this, although the Features contrib module can be used, as we are doing in our own Drupal CMS, to make our configuration fully deployable through our automated deployment process. In Drupal 8, configuration management on a managed workflow seems to offer many benefits over the older version. Configuration is totally separated out into YAML files. These files can then be committed into Version Control System like code, providing accountability and the ability to audit configuration changes. All of this makes Continuous Integration much easier, and may make it configuration rollback possible. The YAML configuration files are imported into the database for added performance, allowing a more robust method of configuration over hook_update_n, or using the current feature module in ways for which it wasn’t strictly designed; drush has also been extended to work with this functionality. This was an interesting talk which made some very useful suggestions for how configuration should be managed between environments when using Drupal 8, as well as how exceptions can be handled. This area should be explored further when planning for the Drupal 8 upgrade; we should look into replacing our reliance on the features module for exported configuration with the equivalent in YAML configuration. One of the many sessions on what is new in Drupal 8 versus Drupal 7, this was an interesting talk giving a high level summary of the mechanisms for customising and extending Drupal 8. Topics covered were plugins, services, events and hooks. In Drupal 8, the principle for plugins is “Learn once, apply everywhere”, moving away from the inconsistencies between modules and how they are used by having plugin classes implement an interface, so there is a common approach. Services in Drupal 8 are very well decoupled and can easily be swapped out, for example for testing purposes. Event handling allows modules to react to Drupal application actions and/or conditions in a standard manner that is common in OOP rather than using hooks to react when something happens. Hooks still exist in Drupal 8, but are primarily for modifying metadata which has been gathered by other means, or to alter forms. One interesting question that was raised at this session was how to determine whether what is needed to implement a feature is a plugin or a service. A useful way to decide this is to think about a service as something that you would usually only have one of for any Drupal instance, for example, a caching service. This succinct outline of mechanisms for extending Drupal 8 highlighted the fact that these mechanisms are less specific to Drupal than in previous versions. Hooks remain, but whereas previously they would have been used for everything, Drupal 8 leverages Symfony to add new ways of doing things that help improve code structure and re-usability. The patterns and techniques are familiar from other contexts where OO is used, which brings a consistency and helps developers to better avoid the unnecessary, and at times frustrating and confusing, proliferation of different ways of doing things. These approaches also help with documentation – creating common patterns for implementing new modules means that Drupal developers are not so much at the mercy of how good the documentation for a particular module is. All of these factors should improve the development experience in Drupal 8. As more application logic is being handled client-side, Front-end Ops is a response to the proliferation of front-end tools and frameworks. This session was not about the Drupal framework, but instead looked at tools for automating front-end development tasks, managing dependencies and generating scaffolding. For scaffolding tasks, Yeoman was demonstrated. Yeoman recommends that your workflow involves Bower for dependency management and Grunt or Gulp for task automation. The session covered installing and using Yeoman, Bower, Grunt and Gulp as well as comparing the merits of Grunt and Gulp. The talk covered the BBC’s Wraith, which leverages PhantomJS and SlimerJS to provide visual diffs of screenshots between two environments, as well as other visual regression tools, namely Huxley and PhantomCSS. There was also a discussion of the test rendering engines available: PhantomJS, SlimerJS, CasperJS and GhostLab. Finally some of the front-end debugging tools available were covered, including Chrome DevTools Remote Debugging which allows you to connect a mobile or tablet to your desktop machine and use the development tools on the desktop browser to inspect the DOM, etc, on the mobile device. This session gave a basic overview of the features and benefits of Docker and of infrastructure as code. It focused on Bowline as an easy way to get started using Drupal on Docker, offering great flexibility and minimum requirements via a suite of BASH scripts that can be included in your Drupal code repositories. The scripts add a method for container installation, and can also be used to “hoist” (start up) other containers at the same time for local development, such as a Behat container for testing. The aim is to simplify and facilitate the configuration and linking of containers for Drupal setups. This definitely looks like the way forward for the provisioning and support, at the very least, of our Dev environments. Taking the paradigm further than just sandboxes for development, the ability to move docker containers through an environment pipeline from Dev to Test and into Production was very interesting and worth further investigation. While much of the session was used to introduce Docker, it was interesting to see the various methods, like Bowline, that are being used to enable developers to work with Docker containers as the next step on from Vagrant. It was also interesting that almost everyone in the room was using Vagrant and had Jenkins as their CI server, and about half were developing on Linux – none of which are currently true for Development Services in general. Using Docker (or something similar) could be beneficial for us, mainly because it would give us readily available, standard and up-to-date environments for development or support use. We do however already achieve something quite similar with virtual machine deployment environments on local machines. As seems to be the current standard, this Docker session also started with the obligatory shipping metaphor-laden introduction to containerisation which I won’t repeat (see https://www.docker.com/whatisdocker for the official version). DrupalCI is a project to make it easier for developers to do local testing, and to enable testing of different combinations of PHP versions and database backends. It works by having a base Docker image, from which a PHP base image and a database base image are created. With only small adjustments containers with variations of these, like PHP 5.5 and PHP 5.6 environments, can be produced. The talk also raised important security points which arise from using containerisation: one needs to think about running a private image registry (an ‘IS Apps Docker Hub’); SELinux should be used to reduce the possibility for malicious containers to break out into the host; and the responsibility for updating the images, and the running containers, is also vital. While it is frustrating to keep seeing the same Docker introductions, it is interesting that so many sessions this year have been dedicated to the technology showing it is being used by many in the community. In this session, Tine Sørensen drew on her years of experience in optimising performance for Drupal sites and troubleshooting scalability issues to highlight some of the techniques that can be used to diagnose issues, pick off the ‘low hanging fruit’ and achieve great improvements without great expense. There is no real value in spending 6 months rewriting some aspect of a module that is not performant if there is only a very small improvement at the end of that time. The recommended starting point when a performance issue is found is to collect data from the site, analyse it, choose where to apply effort – prioritising where ratio of effort to gains is the greatest, then repeat the process until performance is satisfactory. The core message of this talk was the importance of collecting the data to demonstrate what is actually happening, and the huge gains in efficiency when pinpointing performance issues that can be achieved simply by using monitoring tools. Tine focused on New Relic as that is where her experience lies. As we found when we had external consultancy for our Drupal CMS project, New Relic is the tool of choice for monitoring Drupal and diagnosing performance issues; when using the Pro version, the tool has even more functionality such as granting XHProf-like profiling. Like ourselves in Apps, 50% of the audience were using New Relic for Drupal monitoring. Monitoring tools like New Relic can give an extremely useful picture of performance bottlenecks. For example, using the Pro version, it’s possible to see a list of PHP functions being called listed in order of execution time; this shows up any particular function that might be causing problems. A developer can then go straight to the function in question and analyse the code to identify any issues. We have used this technique ourselves whilst developing our Drupal CMS and it certainly can save hours, if not days, of time spent drilling down through XHProf reports. Examples of quick wins were also provided, such as switching from GD to ImageMagick, disabling Views UI, tuning caching and tuning queries that are performing poorly. Of these, the GD/ImageMagick switch is the only one that was unfamiliar. It was particularly interesting to see that the server settings and tuning recommendations correspond to those we already use internally; it is useful to have our current approach validated by the speaker who is an experienced consultant. For me, the main takeaways from this talk were that it is absolutely essential to understand what is happening on the servers when performance is poor, and that the less time you have to spend on collecting that data, the more quickly and efficiently you can resolve the problem. It’s also important not to simply throw hardware at a performance issue; that can resolve things in the short term, but ultimately it only masks the problem, particularly if that problem is not fully understood, with the risk that it could resurface in a more damaging way in future. This session covered the new Plugin system in Drupal 8 which replaces the hook_info() and hook_info_alter() pattern. This is one of the areas where Drupal differs from other CMS’s and frameworks; Symfony bundles are hard-coded whereas Drupal plugins are configurable and discoverable. Plugins do away with many of the Drupal 7 hooks, in favour of the new PluginManagerInterface model and examples of these in core were covered. Plugin autoloading, dependency injection, service containers and annotations were all covered before going on to demonstrations of building your own plugins. The session was very technical, covering low-level code samples in detail. It was a good companion piece to the earlier session on altering and extending Drupal 8. The Drupal 8 theming layer has been re-written and now uses Twig as its template engine. Theme functions are pretty much done away with now and replaced with Twig templates. The theme process hooks are also done away with now that Twig is used. You still have the two levels of template_preprocess and hook_preprocess hooks, but now everything they return in the variables array needs to be a render array. The session also covered writing Twig templates and how to extend Twig with your own custom functions/filters in Drupal. Drupal enables Twig’s auto-escaping; the security issues around this, and how to mark strings as safe so they are not escaped, were also covered. This session was presented by the Head of Sensio Labs (creators of Symfony), Sarah Khalil. It covered the components involved in processing a HTTP request starting with the front controller (app.php in Symfony, index.php in Drupal) passing the Symfony HttpFoundation request through HttpKernel. The Routing component YAML files are named and located differently in Drupal, but in essence the process is unchanged for the router passing the request through the controller and on to returning an HttpFoundation response. Symfony’s Event Dispatcher component was covered in some detail with examples of event listeners and subscribers, the differences between them, and examples of how Drupal core implements these. After listing the seven kernel events that you should know together with the Symfony components used that Drupal uses, the Dependency Injection component’s three key concepts of service container, services and parameters were detailed. Finally a quick look at the concepts in Twig, with the caveat that Drupal does not use all the features available in Twig. This session, although fairly technical, was well presented by clearly very knowledgeable speakers and touched on upcoming technology such as service-worker (client-side caching), ESI and Big Pipe. Content Delivery Networks are external, multi-sited hosts which enable content to be delivered with lower latency from caches local to the user. They can be used just for static assets (JS, CSS, images), and also for dynamic content, although the latter is far more complicated. As proven by our infrastructure with Varnish, delivering anonymous content from a cache is fairly simple as it rarely changes; this advanced session focused mainly on caching authenticated content with CDNs. cache max-age, as found in Drupal 7, which give the time dependencies of what is cached. Together these enable placeholders and auto-placeholdering, whereby Drupal 8 “knows” what content makes up the page and so knows which can be retrieved from a CDN and which needs to be dynamically requested from Drupal. Using this mechanism, it’s possible to perform Edge Side Includes with authentication being cached per session. This could be used with Varnish rather than a CDN, enabling us to cache a lot of our HTTPS traffic, which is where we are currently experiencing our worst performance. The demonstration of the response time improvements from caching user specific content was very impressive. While complicated, I strongly recommend that using Varnish for authenticated users is investigated when upgrading to Drupal 8. This would perhaps be one of the main reasons for considering upgrading when it is finally released. BigPipe ( https://github.com/bigpipe/bigpipe ), a node.js framework which can be used with Drupal 8, was also demonstrated. It breaks up pages into smaller chunks so they can load asynchronously, decreasing the time for the first elements of page content to load. Cut the crap. Practical tips and real world examples for removing waste from your development process. This session dealt with a rather different approach to managing projects, albeit there is a caveat that this covers smaller pieces of work. Basically anything at all that can be deemed as not adding tangible benefit should be removed from the project. We all know that getting decision makers to make decisions quickly can be challenging. So the first thing is to identify your decision maker. In the example given the presenter, Jason Mark, relayed a project that was delivered within 4 weeks. The first week was used for requirements, design and templates and starting the build. The remaining three weeks involved working with the client/partner to test and refine what was delivered. Technology needs must fit and the requirement needs must fit the technology. If there are blockers, especially people, find ways to turn them into champions by using positive creative language. Above all, only focus on things that add value! As Project Manager you can ask this everyday! This session was about headless Drupal. Perhaps the only advantage for us with this is the security advantages of removing some front-end admin components. Alternative means of achieving what we require do however seem quite time consuming and careful consideration of the particular development context would be needed before going down the headless Drupal route. This was an interesting session that would have benefited from demonstrating a concrete example. The material presented was somewhat abstract and the potential for an escalation in complexity and the associated infrastructure requirements of such a system seemed a little daunting without something to tie it to a real world example. However, a centralised logging system would be a great asset to IS Apps even beyond the context of Drupal and EdWeb. An ELK stack, in some incarnation, should be a serious consideration. A disappointing session that was difficult to generalise from, and only seemed relevant in terms of the specific service that the speakers were trying to move into the Amazon Cloud. The Mollom spam protection system seemed far removed from anything managed by IS Apps. It was claimed that the switch to AWS reduced the number of alerts that were received by the Ops team, but no other metrics were presented in terms of savings to the business as a whole. The takeaway from this session seemed simply to be that you need to think differently about services in AWS due to the ephemeral nature of the server instances, these being discarded and new ones spun up any time configuration changed or applications crashed. At the Lightning Talks session, there were 3 commercial companies pitching ideas and providing insight into their products and services. This is a good looking and powerful tool which could be useful for us when working with PHP in Drupal. It has Drupal-specific functionality such as being able to track hooks across your codebase. It also incorporates Git functionality and provides a graphical means for diffing files as well as back tracking changes. In general it seems quite neatly put together and well thought out. One of the main advantages as part of their pitch was hosting in remote locations to assist with latency caused by long distance connections. I cannot see that this is applicable for us. The main point taken from this session is that reverse proxy (Varnish) full page caching is not possible in Drupal 7, but will be in Drupal 8. IS at DrupalCon – Hola Barcelona! It’s 7.30 in the morning in our hotel and I have already overloaded my breakfast plate with so much that I need help to finish what I can’t eat. It must be DrupalCon! This week myself and some colleagues in IS have escaped from autumnal Edinburgh to balmy Barcelona for this year’s European Drupal conference, DrupalCon 2015. For three days we are in the midst of a whirlwind of sessions on all aspects of working with Drupal, many of which touch on issues and experiences that are common to all web developers and site owners. Our journey to create a new Drupal CMS for the University’s main website began before DrupalCon in Prague in 2013. Since last year’s DrupalCon in Amsterdam our new Drupal CMS has moved from its embryonic state following the initial MVP release in 2014 to a production system with a name, EdWeb, and upwards of 140 sites have so far been migrated across to the new system. You can read more about our Drupal journey at the University Website Programme site in EdWeb. Soon we embark on the exciting process of planning the next set of features to add to our shiny new responsive website and I’m sure that as before we will find much to inspire us at DrupalCon. It’s also a fantastic opportunity to explore how other organisations are managing scalability and performance when running an Enterprise level CMS. Judging by the number of cloud hosting companies in the exhibition hall this year, the answer to that problem for many organisations is to let someone else feel at least some of the pain for you! As we did last year, over the next few days we will be gathering together short summaries of some of the sessions we attend here at DrupalCon, with our own reflections on what we see and hear. This year we are fortunate enough to have brought a group of colleagues who have played a range of roles in the creation of EdWeb, from development through to project management and production staff and there is something at DrupalCon for everyone! But before we share any session notes, the Prenote and Keynote sessions from the first day of DrupalCon have already given food for thought. At the centre of the yesterday’s 8am Prenote, which is always an entertaining way to start DrupalCon, was the notion of dreaming the impossible dream, expressed charmingly in song by Adam Juran, in this case the seemingly impossible dream of getting Drupal 8 released. Having been involved with the huge undertaking of building EdWeb from the outset, that sentiment was very familiar! Throughout the ups and downs of such a large scale and complex Agile project, it’s been important to keep our end goal in sight, and to believe that what we are trying to achieve with EdWeb is both possible and necessary. Now we have our production CMS, and it was announced at DrupalCon today that Release Candidate 1 for Drupal 8 will ship on 7th October 2015. Those impossible dreams can be realised! The morning continued with the opening Keynote by Drupal founder Dries Buytaert, and once again we see parallels between the process of getting Drupal 8 to a shippable release and our own experience of building a large scale CMS. This year, Dries’ theme was “We need to talk about that”, covering some of the uncomfortable questions in the Drupal community. Two aspects of his talk in particular struck a chord as they relate to problems that we have also had to solve. In talking about the extended timescale that’s been necessary to get Drupal 8 ready, Dries proposed an alternative model for Drupal’s code management, a branching strategy rather than the current approach of having all development on the trunk. This would embrace the difficult reality of getting all features ready for a release; instead, what goes into the release is only what is ready. During the course of our own CMS development, we have had to solve exactly that problem, releasing feature bundles into the production system at the end of each development iteration without releasing code that is not ready to ship. Our initial workflow was to do development on the trunk, but we quickly realised that this creates problems, particularly as we run our migration project in parallel with ongoing CMS development work. We also had to allow for the release of a security patch for Drupal itself, or for a contrib module we are using, which would need to take precedence over any feature development and go into production sooner, without including features that are not ready. To solve those problems in a way that would support our automated deployment process, we moved to a workflow that turned out to be a variation on Gitflow Workflow and this has served us extremely well, allowing us to manage parallel development work and release only code that is production-ready into our live system. It was very interesting to hear how Dries has come to the same conclusion as us – that for large-scale development work involving multiple developers and many features with a complex life cycle, feature branches are the way to go. The detail of our own approach is a topic for a future post! Another theme of Dries’ talk was usability in Drupal and how features that improve the experience for editors can be sacrificed in favour of features that add new functionality. In creating EdWeb, we have involved users from the outset, whether via quick paper prototyping sessions to determine the best approach for a particular interface detail, or by running sessions where all members of our team, including developers, were able to watch editors actually use EdWeb so we could pinpoint usability problems. That process has contributed hugely to the usability of EdWeb, but it’s undoubtedly true that when the pressure is on to develop new features, it’s very difficult to hold to the discipline of prioritising usability. That problem is not unique to Drupal development; it’s a perennial problem that is particularly troublesome for Agile projects. So there it is – before we even got to 10am on the first morning of DrupalCon, there was already a lot to think about! Watch this space for daily posts with session notes from our team. And if you want to see what we’re so excited about, check out the DrupalCon YouTube channel for session recordings! Yesterday I posted some session summaries from the first full day of DrupalCon 2014 in Amsterdam, where a few members of IS are spending this week. DrupalCon Day 2 began on Wednesday with a Keynote from Cory Doctorow, a thought-provoking talk on freedom and the internet, a subject about which some of us had previously heard him give at the IT Futures Conference in 2013, and one which has significance well beyond the context of Drupal for anyone who uses the web. The broader relevance of Cory’s speech is reflected in many of the sessions here at DrupalCon; topics such as automated testing or developments in HTML and CSS are of interest to any web developer, not just those of us who work with Drupal. 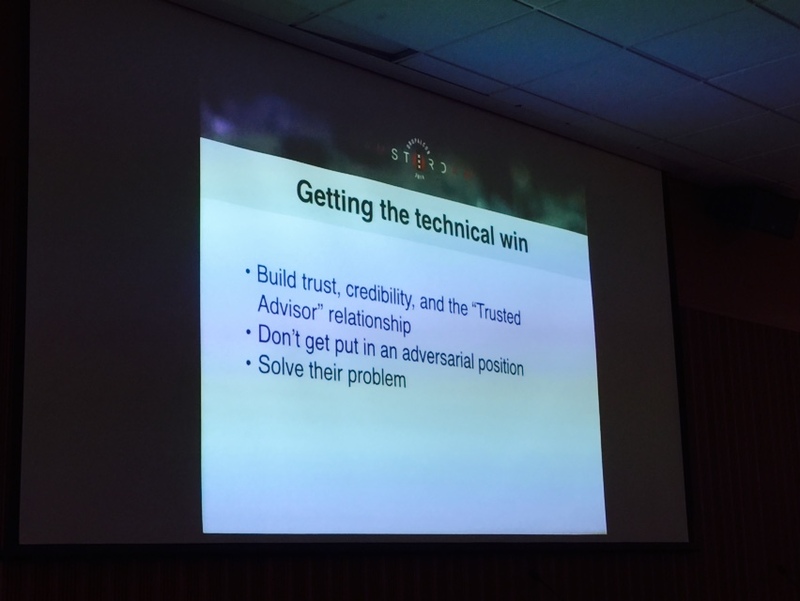 In particular, the very strong DevOps strand at this conference contains much that we can learn from and apply to all areas of our work, not just Drupal, whether we are developing new tools or managing services. Our experiences of some of Wednesday’s DrupalCon sessions are outlined below. Once again, thanks to Aileen, Arthur, Riky, Tim, Andrew, Adrian and Stratos for contributing their thoughts on sessions they attended; any errors, omissions or misinterpretations in their edited summaries are entirely mine. Most of the sessions mentioned below, along with many more interesting talks, are recorded and available on the DrupalCon website, so if the summaries pique your interest, visit the DrupalCon site for more information! The main idea explored in this session was how to create a single DevOps team rather than have separate teams. DevOps is a Movement, a better way to work and collaborate. Rather than make a new team, the current teams should work together with fewer walls between them. The responsibility for adding new features and keeping the site up can then be shared, but this does mean that information needs to be shared between the teams to enable meaningful discussion. automated testing, including synchronisation of data between environments. The framework changes discussed here are an extension of the road we are already on in IS Apps, but the session raised many suggestions and ideas that could usefully influence the direction we take. Our current Drupal infrastructure is configured for logging in the same way as the rest of our infrastructure – in a very simple, default manner. Apache access and error logs and MySQL slow query logs in the default locations, but not much else. Varnish currently doesn’t log to disk at all as its output is too vast to search. If we are having an issue with Apache on an environment, this could mean manually searching through log files on four different servers. Monitoring isn’t setup by default by DevTech for our Linux hosts – we would use Dell Spotlight to diagnose issues, but it isn’t something which runs all the time. IS Apps is often unaware that there is an issue until it is reported. We are able to solve these issue by using some form of logging host. This could be running a suite of tools, such as the ‘ELK stack’, which comprises Elasticsearch, Logstash and Kibana. By using log shipping, we can copy syslog files and other log files from our servers to our log host. Logstash can then filter these logs from their various formats to a standard type, which Elasticsearch, a Java tool based on the Lucene search engine, can then search through. This resulting aggregated data can then be displayed using the Kibana dashboard. We can also use these log “monitors” to create metrics. Logstash can write out to Graphite which can act as a counter of this data. Grafana acts as a dashboard for Graphite. As well as data from the logs, collectd can also populate Graphite with system data, such as CPU and memory usage. A combination of these three tools could potentially replace Spotlight for some tasks. We need this. Now. I strongly believe that our current logging and monitoring is insufficient, and while all of this is applicable to any service that we run, our vast new Drupal infrastructure particularly shows the weaknesses in our current practices. One of the 5 core DevOps “CLAMS” values is Measurement, and I think that an enhanced logging and monitoring system will greatly improve the support and diagnosis of services for both Development and Production Services. When it comes to improving Drupal performance, there are three different areas to focus on. The front end is important as render times will always affect how quickly content is displayed. Data and IO at the back end is also a fundamental part; poor SQL queries for example are a major cause of non-linear performance degradation. While caching will greatly increase page load times, for dynamic content which can’t be cached, the runtime is a part of the system which can be tuned. The original version of HipHop compiled PHP sites in their entirety to a C binary. The performance was very good, but it took about an hour to compile a Drupal 7 site and it resulted in a 1 Gb binary file. To rectify this, Java Virtual Machine-like Just In Time compilation techniques were introduced for HipHop Virtual Machine (HHVM) which runs as a FastCGI module. Performance testing has shown that PHP 5.5 with OPcache is about 15% faster than PHP 5.3 with APC, which is what we are currently using, and HHVM 3.1 has about the same performance improvement again over PHP 5.5. However, despite the faster page load times, HHVM might not be perfect for our use. It compiles pages with Hack, which uses strong typing, rather than PHP, and it doesn’t support all elements of the PHP language. It is still very new and documentation isn’t great, but this session demonstrates that it is worth thinking about alternatives to the default PHP that is packaged for our Linux distribution. There are also other PHP execution engines, PHPng (which PHP 7 will be based off of), HippyVM and Recki-CT. In IS Apps, we may want to start thinking about using the Red Hat Software Collections repository to get access to a supported, but newer, and therefore potentially more performant, version of PHP. This technical session provided a very nice overview of content staging models and how these can be implemented in Drupal 8. There was a presentation of core and contrib modules used, as well as example code. The process runs by comparing revisions and their changes using hashcodes and then choosing whether to push to the target websites. What I would take from this session is that it will be feasible to build content staging in Drupal 8 using several workflows, from simple Staging to Production, up to multiple editorial sandboxes to production or a central editorial hub to multiple production sites. One understandable caveat is that the source and target nodes must share the same fields otherwise only the source fields will be updated, but this can be addressed with proper content strategy management. Whilst this session focused on Drupal 8, the concepts and approach discussed are of interest to us as we explore how to replicate content in different environments, for example between Live and Training, in the University’s new central Drupal CMS. This session explored three aspects of automated testing: functional testing, performance testing and CSS regression testing. From the perspective of developing the University’s new central Drupal CMS, there were a number of things to take away from this session. the ability to easily capture page status to detect, for example, 404 errors, without writing custom code as with Selenium. For these reasons, we should explore CasperJS when writing the automated tests for our Drupal theme, and ultimately we may be able to refactor some of our existing tests in CasperJS to simplify the tests and reduce the time spent on resolving intermittent Selenium WebDriver issues. On the performance testing front, we do not currently use any automated testing tools to compare such aspects of performance as page load time before and after making code changes. This is certainly something we should explore, and the tools used during the demo, PageSpeed and Phantomas, seem like good candidates for investigation. A tool such as PageSpeed can provide both performance metrics and recommendations for how to resolve bottlenecks. Phantomas could be even more useful as it provides an extremely granular variation on the kind of metrics available using PageSpeed and even allows assertions to be made to check for specific expected results in the metrics retrieved. On performance, see also the blog post from DrupalCon day 1 for the session summary on optimising page delivery to mobile devices. Finally, CSS regression testing with Wraith, an open source tool developed by the BBC, was demonstrated. This tool produces a visual diff of output from two different environments to detect unexpected variation in the visual layout following CSS or code changes. Again, we do not do any CSS regression testing as part of our deployment process for the University’s new central Drupal CMS, but the demo during this talk showed how easy it could be to set up this type of testing. The primary benefit gained is the ability to quickly verify for multiple device sizes that you have not made an unexpected change to the visual layout of a page. CSS regression testing could be particularly useful in the context of ensuring consistency in Drupal theme output following deployment. I can highly recommend watching the session recording for this session. It’s my favourite talk from this year’s DrupalCon and worth a look for any web developer. The excellent session content is in no way specific to Drupal. Also, the code samples used in the session are freely available and there are links to additional resources, so you can explore further after watching the recording. Having attended a similar, but much simpler and more technically focused, presentation at DrupalCamp Scotland 2014, my expectation from this session was to better understand Behaviour Driven Development (BDD) and how Behat can be used to automate testing using purpose written scripts. It was showcased how BDD can be integrated easily in Agile projects because its main driver of information is discussions regarding business objectives. In addition to user stories, examples were provided to better explain the business benefit. I strongly believe that this testing process is something to look deeper into as it would enable quicker, more comprehensive and better documented user acceptance testing to take place following functionality updates, saving time in writing long documents and hours of manual work. Another clear benefit is that the examples being tested reflect real business needs and requests, ensuring that deliverables actually follow discussed user stories and satisfy their conditions. Finally, this highlights the importance of good planning and how it can help later project stages, like testing, to run more smoothly and quickly. This session was held in one of the smaller venues and was hugely popular; there was standing room only by the start, or even “sitting on the floor room” only. Obvious health and safety issues there! The focus of this session was to explore Drupal modules that can help improve the UX for CMS users who may be intimidated by or frankly terrified of using Drupal, demonstrating how it is possible to simplify content creation, content management and getting around the Admin interface without re-inventing the wheel. customising and controlling how each CMS user interacts with the Admin menu system using modules such as Contextual Administration, Admin Menu Source and Admin Menu Per Menu. The most interesting thing about this talk in light of our experience developing the University’s new central Drupal CMS is how closely many of the recommendations outlined in this session match our own module selection and the way in which we are handling the CMS user experience. It is reassuring to see our approach reflected in suggested best practices, which we have come to through our knowledge and experience of the Drupal modules concerned, combined with prototyping and user testing sessions that have at times both validated our assumptions and exposed flaws in our understanding of the user experience. As was noted in this session, “Drupal isn’t a CMS, it’s a toolkit for building a CMS”; it’s important that we use that toolkit to build not only a robust, responsive website but also a clear, usable and consistent CMS user experience. This Presentation started with the bold statement that no one cares about the technology be it Drupal, Adobe, Sitecore or WordPress. Business’s care about solutions and Drupal can offer the solution. Convincing people is hard, removing identified blockers is the easier bit. Take a step back and don’t dive into a solution immediately. Asking these kinds of questions will help build a trusted relationship. To this end it is sometimes a necessity in certain situations to be realistic and sometimes there is the need to say no. Understanding what success will look like and what happens if change is not implemented are two further key factors. The presentation then moved on to technical themes. It is important to acknowledge that some people have favoured technologies. While Drupal is not the strongest technology, it has the biggest community and with that huge technical resources, ensuring longevity and support. Another common misconception is around scalability. However, Drupal’s scalability has been proven. Although this was a sales presentation it offered valuable arguments to call upon when encouraging new areas to come aboard the Drupal train. This session primarily explored how best to future-proof a Drupal site by selecting modules chosen from the subset that have either been moved into Drupal core in version 8 or have been back ported into Drupal 7. We are already using most of the long list of modules discussed here for the University’s new Drupal CMS. For example, we recently implemented the picture and breakpoints modules to meet responsive design requirements, both of which have been back ported to Drupal 7. This gives us a degree of confirmation that our module selection process will be effective in ensuring that we future-proof the University’s new central Drupal CMS. In addition to the recommended modules, migrate was mentioned as the new upgrade path from Drupal 7 to Drupal 8, so we should be able to use the knowledge gained in migrating content from our existing central CMS to Drupal when we eventually upgrade from Drupal 7 to Drupal 8. The framework underpinning Drupal 8 is Symfony2, and whilst we are not yet using Drupal 8, we are exploring web development languages and frameworks in other areas, one of which is Symfony2. As Symfony2 uses OO, it’s also useful to see how design patterns such as Dependency Injection are applied outside the more familiar Java context. recommended use of Composer for development using any PHP framework, not just Symfony2. I have attended two or three sessions which talk about Symfony2 at this conference as well as a talk on using Ember.js with headless Drupal. It’s interesting to note that whilst there are an increasing number of web development languages and tools to choose from, there are many conceptual aspects and best practices which converge across those languages and frameworks. In particular, the frequent reference to the MVC architecture pattern, especially in the context of frameworks using OO, demonstrates the universality of this particular approach across current web development languages and frameworks. What is also clear from this session is that standardisation of approach and separation of concerns are important in all web development, regardless of your flavour of framework. This tech-heavy session looked at the past, present and future of the relationship between HTML and CSS, exploring where we are now and how we got here, and how things might change or develop in future. Beginning with a short history lesson in how CSS developed out of the need to separate structure from presentation to resolve cross-browser compatibility issues, the session continued with an exploration of advancements in CSS such as CSS selectors, pseudo classes, CSS Flexbox, etc. and finally moved on to briefly talk about whether the apparent move in a more programmatic direction means that CSS may soon no longer be truly and purely a presentational language. There was way too much technical detail in this presentation to absorb in the allotted time, but it was an interesting overview of what is now possible with CSS and what may be possible in future. In terms of the philosophical discussion around whether programmatic elements in CSS are appropriate, I’m not sure I agree that this is necessarily a bad thing. It seems to me that as long as the ‘logic’ aspects of CSS are directed at presentation concerns and not business logic, there is no philosophical problem. The difficulty may then lie in identifying the line between presentation concerns and business concerns. At any rate, this is perhaps of less concern than the potential page load overhead produced by increasingly complex CSS!